Jessye Norman is a regal Ariadne, the mythological Greek heroine in this opera-within-an-opera, opposite the passionate Bacchus of the great James King. 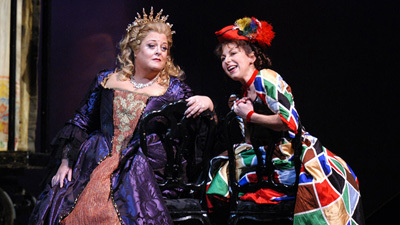 Kathleen Battle delivers the coloratura fireworks of Zerbinetta, the leader of a commedia dell’arte troupe that finds itself stranded on Ariadne’s island. Tatiana Troyanos and Franz Ferdinand Nentwig star as the young Composer and the Music Master in the opera’s prologue. James Levine brings out all the color and charm of Strauss’s brilliant chamber-sized score with its equal amounts of pathos and humor. Bodo Igesz’s production features sets by esteemed designer Oliver Messel.